Grandchildren needed something that all ages and heights could play together AND would give them exercise. This seemed to fit the bill and they do love it from 3-9 years old. Merchant response: Thank you for this great review! I purchased this for my son's 12th birthday. 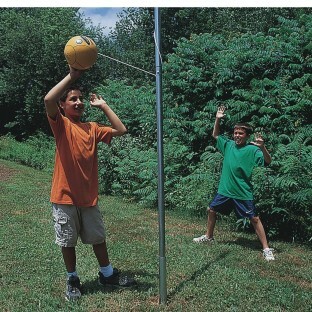 He plays tetherball at school and I decided to get him one of his own. I like that its simple to put together and will get just about anyone involved. It improves hand-eye coordination and helps to teach sportsmanship. This is a great buy at this price and will bring alot of joy to those who will play.